Unlabelled NEWS : 3 CORRUPT POLICE MEN DISMISSED FROM POST. NEWS : 3 CORRUPT POLICE MEN DISMISSED FROM POST. The Lagos State Police Command has dismissed three police officers over illegal arrest and extortion. 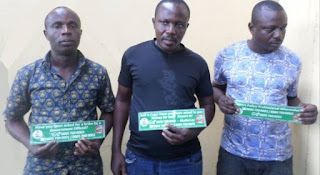 The police officers were dismissed by the Lagos State Police Command after being found guilty of illegal arrest and extortion and the names of the disgraced officers has been given as Okelue Nkemeonye, Braimoh Sunday and Yusuf Olukoga. The Assistant Commissioner of Police Abayomi encouraged members of the public to report police misconduct to the command. “Upon the receipt of the complaint, a case with tracking number PCRRU637624 was registered and acknowledgement of complaint sent to the complainant.